The Aspire Gusto Mini is a compact pod mod style vaping system which is easy to use and designed with the best possible vape in mind. Its convenient, all in one compact design makes it easy to get started with and it can be used for both mouth to lung and direct to lung vaping. Small in size and weighing just 78g, the Aspire Gusto Mini takes its own 2ml pod-style cartridges which simply slot into place and you’re ready to go. The cartridges are easily removed removing the mess of topping up your vape kit and as you would expect from Aspire, the build quality is second to none. Gusto pods are available in a wide range of flavours and the simple to use design of the Gusto Mini makes it a great choice for both new and experienced vapers. Element NS range of e-liquids utilise nicotine salts, a form of nicotine which delivers a hit closer to that of a traditional cigarette while offering less harshness when inhaling. Element have brought over eight of their most popular liquids from their core, Tobacconist and FAR ranges into the NS line to cater to a wide variety of tastes and preferences. Element NS Pods contain 20mg or 10mg of nicotine per millilitre of e-liquid. This is my third Aspire Gusto mini, I now have them in many colours! I love the Aspire Gusto mini because it is small and the nic salts give me the hit I need. It fits nicely in my small handbag which remains flat and not bulky with so many items. The battery lasts for ages and is quick to charge too! I've had so many different vapes during my 3 years of vaping and this is my absolute favourite! Brilliant, just what I wanted and so easy to use. This is hands down the best vape I have ever used. I had originally stopped smoking for a year after using an aspire pockex vape using 6mg liquid. However my habit got the better of me and starting smoking again which proceeded for a year or so. Since I have had this vape I have managed to stop smoking and don’t even crave a cigarette. The beauty of this product is that you can use higher nicotine strengths without it burning your throat like may other vapes do. I couldn’t recommend this product enough. It is the perfect vape , with a great design and very compact. Nice small system - fits well in the hand - good amount of vapour produced. Only negative was that the pods did not fit properly- On quite a few occasions I went to take a draw and nothing happened - found giving it a knock or two and it worked. The unit has only been standing on the side and not taken out in my pocket so that was not the cause. If you want to stop smoking, this is the best I have found. Closer to the experience of smoking a cigarette. I really like this kit, its very small and the battery last long. I bought the grey/black one, my friend recommended this kit and I got it cheaper on this site. Thank you for the easy delivery, will defo buy more flavors from here. Can you please get more exotic flavors please!! Thanks Foyz. I really like this product as it is very easy to use, no cleaning or replacing coils etc. Unfortunately this is the third pod mod I’ve had to buy this year. The first one, pods didn’t fit correctly and the second the bottom broke after a couple of months. I’ve bought a third and we’ll see how we get on but may have to try something else. There is also an issue with the pods leaking. Nice flavours and good draw. Similar to smoking cigarette. Simple. Pressing button 5 times to start and end is not always possible as it doesn't always work. Simple, reliable and satisfying for an ex smoker. If you have a cupboard full of mods and tanks, but never quite kicked the smoking habit due to leaks, unreliable coils and hassle of self builds, this could be the answer. Just pop in a pod and go,. This has never leaked or spat hot liquid (even if extending the pod life), and the airflow seems just right for dtl (which not many pod systems cater for). The best vaping purchase I have ever made (and relatively one of the cheapest). Can’t wait for the new flavours to arrive. Simply the best. Quick and easy. Good looking, pocket sized and efficient. Really feels like a hit of nicotine for people who are wanting to quit smoking and I'm almost ready to buy another because of old habits with dippers and liking having a back up and secondary flavour. Would love to know when the new flavours are gonna be released? Great improvement recently from the range of strength for nicotine, thank you! 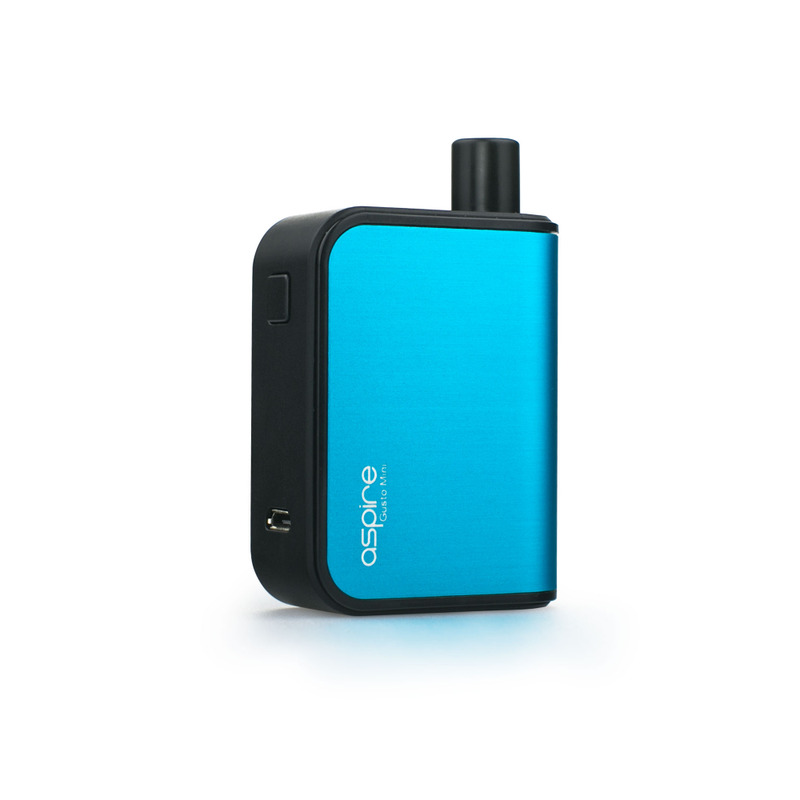 I love the aspire gusto mini device it’s compact, easy to use, charges quickly and provides a nice vape! Great for MTL or DL with the Ns/20 pods! The only thing I would add would be a narrow drip tip for MTL as the one you get is more for DL use! I just put a different drip tip on but would be a nice touch to have one included! If only the pods weren't so expensive this could have been my way of giving up smoking. The unit itself is great, feels well made, produces a nice amount of vapour and the battery lasts me longer than a day. The nic salts are amazing, after a year of trying different vape options this is the only thing that can stop me craving a fag, just a shame a pod only lasts me a day and I'm not a heavy user at all. Also had varied results with the pods themselves, all the Frost flavour pods vaped consistently well, but the Pink Lemonade ones were not good, and at a tenner for 3 it was a bit of a let down. Hopefully they'll bring the price of the pods down and improve their performance and consistency because this really is a great bit of kit, in combination with the big salts it really could be a game changer for more people like me wanting to quit smoking. Came to this after having a pretty negative experience with the Bo One (having to get it replaced three times due to it breaking!!!). Love the nicotine salt liquids - pods last me WAY longer than the Bo pods, which only lasted me a day max!! The fact that the nicotine hits in a similar way to a cigarette makes it so that you don't have to use it as much. This also means that the £10 cost for a pack of pods is sort of justified - going through them slower means you won't have to buy a new pack as often. Battery life has also been really good. Supposedly there are more e-liquid manufacturers jumping on board so hopefully there'll be a wider selection of flavours soon.. If you're coming from cigarettes, this is by far the best device to help you transition from smoking to vaping. Not a great experience. Left this in my pocket and it emptied its contents entirely over my clothes!